The LifeKeeper GUI server is initialized on each SIOS Protection Suite server at system startup. It communicates with LifeKeeper GUI clients using Hypertext Transfer Protocol (HTTP) and Remote Method Invocation (RMI). 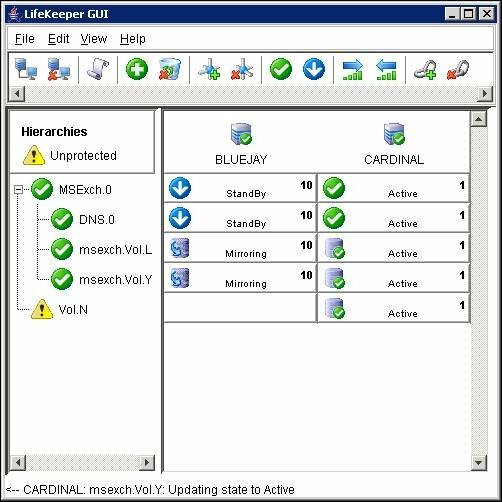 You can connect to the LifeKeeper GUI server with a web client that can be run from any system that can connect to Ports 81 and 82 of all servers in the cluster or with an application client that ships with SIOS Protection Suite and is designed to run on a server in the cluster. Pop-up server and resource context menus provide access to server- and resource-related actions. The menu bar provides access to all LifeKeeper GUI actions. The toolbar provides quick access to many SIOS Protection Suite actions. The status window displays a graphical representation of the servers connected in the cluster, resource hierarchies and the status of resources and servers. The message bar at the bottom of the window displays processing information to the user.